SketchUp lets you import CAD data for your models. There’s a technique for modeling simple walls and other straight elements on top of imported CAD linework that’s so simple and enjoyable, that audiences regularly applaud when it’s demonstrated. Before you get started, make sure you’re not editing the component that contains your imported CAD linework. Remember that you’re using the CAD drawing as a reference underlay for your own 3D modeling activities. You’ll be working “on top” (outside) of the component. Use the Axes tool to line up the colored modeling axes with the wall you’re about to model. If the axes are already parallel to the wall, you can skip this step. If not, just choose Tools → Axes and line up the modeling axes with an edge in the CAD drawing that represents the wall you’re working on. Draw a rectangle next to the wall. It doesn’t matter how big it is; you’ll see why in a moment. 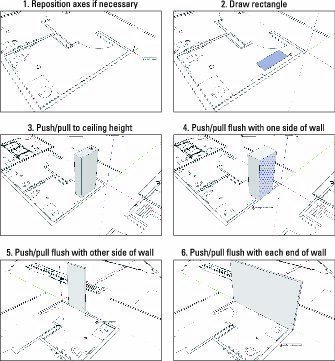 Use the Push/Pull tool to extrude the rectangle up to the height of the wall you’re modeling. If you don’t know it just yet, just guess. It’s easy to change this later. Use the Push/Pull tool to extrude the box you just made so that it’s flush with one side of the wall. If you drew the rectangle in Step 3 to the outside of the wall, push/pull the face so it’s flush with the inside of the wall. The key to this step is pure SketchUp Inferencing 101: Click to start pushing/pulling, hover your pointer over the edge (or its endpoint) that you’re aiming for, and then click again to stop pushing/pulling. You’re using the imported CAD edge as an inferencing reference for your tool. It’s cake after you’ve done it once or twice. Use the Push/Pull tool to make the opposite face of the box flush with the other side of the wall. See what’s happening? You’re using the Push/Pull tool and carefully chosen inferences to turn the box into the wall. Push/pull the ends of the 3D wall so they match the underlying drawing. Modeling a simple wall based on a couple of edges in an imported CAD drawing. What happens when walls meet up at corners? Well, that can happen at right angles (which is common) or at other angles (which isn’t uncommon).